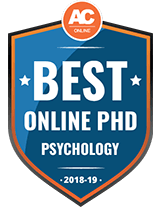 What Can I Do With an Online Doctorate in Psychology? Earning a doctoral degree involves a significant commitment of both time and effort. A bright employment outlook in psychology attracts candidates who display exceptional initiative, integrity, and acumen. In addition, the U.S Bureau of Labor Statistics (BLS) projects a 14% growth rate for psychologists through 2026, with job prospects higher for graduates of Ph.D. programs. Read on to explore career paths, program requirements, and licensure guidelines for doctoral students in psychology. With so many online psychology PhD degrees available, choosing the right one can be tricky. One of the biggest advantages of getting an online degree is the flexibility it offers. But that’s only one factor—students also should consider the cost of the program, the specific concentrations offered within a degree, and the program’s job placement rate for graduates. We’ve applied those factors, as well as many others, in creating our list of the best online psychology PhD degrees. Liberty University developed the 100% online Doctor of Nursing Practice (DNP) in Psychiatric Mental Health program to help nursing professionals get specialized mental health training to meet all their patients' needs, not just their physical ailments. For nursing professionals with an M.S. in Nursing, Nurse Practitioner certification and experience in the field, this program will provide advanced training in nursing administration, nursing care best practices and mental health. Graduates also will be prepared to obtain additional, specialized certifications such as the American Nurse Credentialing Center Psychiatric Mental Health Nurse Practitioner national exam. Coursework includes theoretical application for advanced practice nursing, clinical psychopharmacology, psychotherapeutic theories, frameworks and modalities, nursing research, and policy and ethics. The online DNP can be completed in as little as 2 years, but must be completed within 5 years. Courses are taught in 8-week cycles. A total of 58 credit hours is needed to graduate, including 27 in core courses, 17 in the psychiatric mental health nurse practitioner cognate, and 14 in project and practicum courses. Academic advisers help online students with registration, financial aid, class enrollment and degree completion planning. DNPs open up career opportunities, including psychiatric mental health nurse practitioner, nursing administrator, clinical researcher and social service programs. The program, which is accredited by the Commission on Collegiate Nursing Education, is currently accepting only students who are Virginia residents. The online Doctorate of Philosophy in Counselor Education and Supervision at Adams State University prepares graduates to work as counselor educators, supervisors, researchers and practitioners in diverse academic and clinical settings. Applicants and admitted students must attend selection interviews and new student orientation, respectively. Prospective students are evaluated on academic aptitude for doctoral-level study, previous professional experience, fitness for the profession (including self-awareness and emotional stability), oral and written communication skills, cultural sensitivity and awareness and potential for scholarship, professional leadership and advocacy. In addition to becoming skilled in advanced clinical counseling, program graduates will also be able to supervise counselors and counseling students, conduct research, write for professional publications and become counseling leaders, mentors, practitioners and consultants. Courses include Quantitative Research Methods, Supervision and Consultation, Advanced Multicultural Issues, Advanced Group Counseling, Data Analysis, and Advanced Assessment. Students also participate in practicums and internships. Students typically enroll in 6 credit hours per semester and cohorts begin every fall semester. The 66-credit program requires 4 1-week summer residencies. To graduate, students must maintain a 3.0 GPA and complete a written comprehensive exam and a research project/dissertation. Graduation from the program doesn't equate to a professional license. Students must obtain a professional counseling license and/or appropriate certifications prior to, or during their first 2 years as a doctoral student. All program participants are assigned an academic advisor who is a faculty member in the Counselor Education Department. Advisors participate in student orientation, provide academic and career advisement and offer professional counseling referrals for students in need. The Ph.D. Counselor Education and Supervision program is accredited by the Council for Accreditation of Counseling and Related Educational Programs. Penn State strives to offer graduate students a uniquely empowering experience. The more than 40 faculty members in the Penn State Department of Psychology work closely with students not only in facilitating the delivery of coursework, but in consulting with students on enhancing their professional development in order to be more competitive in the workplace, including grant writing and other funding-related activities. Graduate students may also take advantage of teaching assistantships, as the department is known as a strong producer of psychology faculty. The department treats graduate students like colleagues, frequently integrating students into research activities and sending them into the community to put their skills to work. A Ph.D. in psychology at Penn State may be earned in one of 5 program areas: clinical (including adult and child-clinical), cognitive, developmental, industrial/organizational and social. Prospective students must choose one upon applying, and the path may only be changed with faculty approval. Students admitted into this on-campus program work one-on-one with faculty to devise the details of their individual programs, which includes a major and a minor (which may be one of the other four psychology paths or another subject altogether). For certain students, Penn State's dual-degree programs in psychology may also be appealing. These two programs combine doctoral studies in psychology for Ph.D. candidates with either women's studies or language science, providing students the opportunity to graduate with Ph.D.s in two subjects and extend their psychology work. Although programs are highly flexible and developed by students and faculty, basic curriculum requirements include English language, statistics, 18 credits of major area course work, a breadth requirement and research. Typically, programs last 4-5 years. In order to graduate, students must remain in good standing, meaning that no failing grades are earned during program courses and that grades lower than B+ are not received in multiple courses. The majority of students accepted into Penn State's highly selective graduate program in psychology have earned undergraduate degrees in psychology; those from other disciplines are accepted, but applicants should have some background in psychology. Applicants must submit sample papers to demonstrate their writing skills, as well as statements of purpose, and they should have taken the general GRE (there is no minimum score requirement). The psychology subject test is also strongly recommended for those interested in the clinical program, especially for those who did not major in psychology in undergrad. Students looking to earn a doctoral degree in psychology in a convenient, accelerated delivery method may find Tuoro University Worldwide's online Doctor of Psychology (Psy.D.) in human and organizational psychology an attractive option. This 100% online program offers students: 1) the opportunity for an accelerated admissions process that requires no GRE scores; 2) an accelerated pace comprised of 8-week course terms; 3) no requirement for residency; and 4) an affordable online tuition of $700 per semester credit unit. This professionally oriented program prepares students to design evidence-based solutions in the profession of psychology, and it emphasizes practice over theory. Students may select one of three concentrations: organizational, leadership or industrial psychology. The program begins with courses in theory and research, then quickly shifts toward putting theory into practice; once required courses are completed, students begin constructing proposals (pre-dissertation) and their dissertations. Each student works with a faculty dissertation chair and a committee, all of whom assist the student with completing the dissertation. The 66-credit program (including dissertation) provides students with faculty research guidance, and faculty are scholar-practitioners who currently work in the field. Students should note that this degree does not prepare students for any type of licensure. The program is intended to be completed in 5 sessions; those who need more time must pay continuation course tuition of $500, which earns no credit and does not qualify for financial aid. To apply for the program, applicants must possess master's degrees where they earned cumulative GPAs of 3.4 or greater. Following that, students submit their applications with transcripts from all institutions attended, two letters of recommendation (academic and professional) and a doctoral entrance essay that presents, in narrative form, the student's biographical information, career plan and goals in pursuing this degree. Once students are admitted, they have access to advisers who serve as coaches, regularly monitoring academic activity and meeting with students once per session to review their educational plans. They can assist students with developing individualized degree plans and provide advice on courses. Students also have access to career resources, to assist students with networking or finding jobs and internships. The Chicago School of Professional Psychology at Los Angeles provides several master's and doctoral-level programs in psychology specialties. Its 5 Doctor of Philosophy (Ph.D.) offerings cover subjects related to psychology, including applied behavioral analysis, business psychology, international psychology and organizational leadership, but its only Ph.D. directly offered in psychology is a post-master's behavior analysis specialization program. This full-time, 5-year program offered on the Los Angeles campus prepares graduates to pursue careers as behavior analysts and licensed psychologists, or they may also go on to work as teachers, administrators, researchers or clinicians. The coursework in this program is taught by practitioner faculty, and it emphasizes the study of behavioral principles to affect positive behavior change. A sampling of courses includes applied behavioral analysis, psychological assessment and intervention, and critical analysis of research in verbal behavior. Though not all states require behavior analysts receive licenses, including California, this program is designed to prepare students to pursue (with further coursework and supervised professional experience) licensure with the California Board of Psychology. The Chicago School's Los Angeles campus enjoys a diverse, urban location that offers psychology students proximity to numerous hands-on, career-relevant opportunities for professional development and community service. Students work closely with faculty to provide services to real clients, such as therapy, law-enforcement training or management consulting, or they may apply knowledge gained in their programs to assist local service agencies or advocacy groups. Students in the Ph.D. in psychology program also gain hands-on learning experience in The Chicago School's ConCISE (CONsulting within Southern California's Communities through Innovation, Service and Education), a student-run firm providing human capital consulting to businesses and nonprofit organizations. Because of its professional focus, The Chicago School asks applicants to submit, resumes or curriculum vitaes, along with their applications, as well as an essay, transcripts from all colleges attended and 3 letters of recommendation. Application is open to anyone who has earned a master's degree in psychology, education, behavior analysis or a related degree recognized by the Behavior Analyst Certification Board (BACB) and either holds a current Board Certified Behavior Analyst (BCBA) certification, or has completed the BACB-approved courses required to qualify for the BCBA exam. Given the competitive nature of many doctoral programs, consider your career goals carefully as you explore your education options. While a master’s degree may suffice for some positions in school psychology, counseling, and industrial-organizational psychology, the vast majority of students who aspire to tenure-track professor positions and independent clinical private practice roles pursue doctoral degrees. Online Ph.D. programs in psychology typically focus more heavily on advancing scientific research. Doctoral students undergo comprehensive exams and submit a dissertation representing an original contribution to psychology. Master’s degree graduates often provide mental health services and work in administrative roles, but many do not require a thesis. If your primary career goals involve counseling patients or mental health advocacy, you may consider a terminal master’s degree. If you prefer conducting psychological research and treatment, you may decide to explore a Ph.D. program. 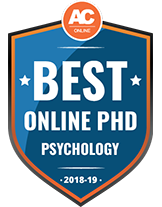 Thanks to the adaptability and breadth of psychology as a field, graduates of Ph.D. in psychology online programs may pursue a variety of careers and specialties. Clinical psychologists generally focus on assessment, diagnosis, and treatment of psychopathology. A few of the most popular specialties for clinicians include health psychology, school psychology, neuropsychology, and industrial-organizational psychology. Psychologists may consult with government agencies, provide program evaluation services for public health organizations, or conduct forensic mental health evaluations in courtrooms. Graduates with an online psychology Ph.D. degree whose primary interests lie in quantitative research, experimental psychology, and other scientific scholarship often pursue jobs in higher education or at research institutes. As specialists with interdisciplinary applications, psychologists also possess expertise that lends itself to professional consulting work in blended roles, such as applications of behavior change and health technology. While career paths vary, and employers often seek out graduates of Ph.D. programs, psychology typically involves a selection of widely recognized job titles. The section below features three of the most common titles for these experienced professionals. Psychologists study the relationship between the brain, behaviors, and environments. Responsibilities include conducting research, observing and evaluating human behavior, and applying psychological principles in settings like schools and health centers. Clinical psychologists diagnose, assess, and treat psychopathology. Job duties include conducting patient interviews, handling diagnostic assessment tests, consulting with healthcare teams, and designing behavior modification programs. Research scientists collect and analyze data using scientific methods. Their responsibilities include performing laboratory experiments, conducting observations, and reporting their findings at conferences or for publication in professional journals. Many variables affect salaries for graduates of online Ph.D. psychology programs, including the employer, experience level, geographic region, and sector. Location can hold the strongest influence, as psychologists in some U.S. cities earn up to 43% above the national average. Psychologists working in private sector management or research positions in industrial-organizational psychology typically earn more than those in postsecondary teaching. Other well-compensated roles for a graduate with a doctoral degree in psychology include psychological testing, private practice counseling, health psychology, and forensic psychology. The American Psychological Association (APA) website provides further information on salaries. Students in doctoral programs in psychology typically complete 80-120 credits, including all coursework and dissertation work. Most students complete the degree within four to seven years. Many programs consider five years of study ideal, in the interest of ensuring optimal time for proper professional development, and encourage students to plan accordingly. Most online programs require students to complete face-to-face clinical work hours at an approved location. Students must secure their own internship placement under the supervision of faculty. Some programs also require short-term, on-campus residencies or field experiences. This course surveys applications of psychological principles, assessment methods, treatment, and behavior change in clinical settings. Topics include intake, case formulation, differential diagnosis, evidence-based therapies, clinical crisis management, and diagnostic methods appropriate for children and adults. Students examine a variety of theoretical approaches in social psychology, including development and treatment in clinical practice. Approaches covered include hermeneutics, social constructionist, and existential-phenomenological. Students analyze psychological theories of social influence, including a survey of contemporary research. This course provides an overview of quantitative methods and research processes, including sampling, research design, and data analysis. Students explore ethical and legal factors, such as informed consent and measurement concepts, including validity. This can involve score interpretation and statistical concepts, including correlation, frequency distributions, and variability. Learners study the principles, practices, history, and theoretical foundations of psychological assessment. Topics include diagnostic instruments, selection, scoring, validity, psychometric principles, and statistical concepts. Using case studies, students explore legal and ethical issues in interpretation and communication of assessment information. This course focuses on mental disturbance and behavioral maladjustment in children and adults. Using case histories with an emphasis on contemporary cross-cultural research, students examine classification, interpretation, and modification of disturbed behavior. Topics include etiology, environmental factors, and treatment outcomes. Students explore the interdependent roles of emotion and cognition in behavior and experience. With an emphasis on neuropsychoanalytic theories of cognition, students examine knowledge acquisition, memory, perception, and sensation. Related topics include language development, social cognition, and decision-making. This course covers principles, administration, and mechanisms of psychotropic medications from a client empowerment perspective. With an emphasis on multicultural issues and individual variability, students explore drug interactions, comorbidity, efficacy, side effects, neurochemistry, and treatment outcomes. This course explores human development throughout the lifespan for individuals and families, including a broad overview of cognitive, biological, cultural, and social theory and research. With an emphasis on healthy development and cultural differences, students explore methods of addressing developmental challenges. All APA-accredited doctoral programs require students to complete a one year predoctoral internship near the end of the doctoral program, usually in the final year. Accredited internships serve as a gatekeeping function for the profession and provide top-notch training to cultivate and hone the student’s skills in clinical practice and consultation. Practicum experiences typically take place during a residency period in on-campus counseling centers under the supervision of full-time faculty members. Most programs begin with a one-term orientation, and students manage clientele in the second term. Some schools also require additional pre-practicum experiences in which students develop suitable therapeutic approaches. Students complete externships or field experiences through a clinical placement at an offsite location outside the student’s program. Candidates often proceed through three stages for an externship, beginning with one a week at a selected site and progressing to 16-20 hours of fieldwork at the intermediate and advanced stages. Under the direction of a faculty committee, psychology Ph.D. candidates undertake dissertation work that requires an original contribution to research. This represents the culmination of the student’s work, including a formal dissertation proposal, an oral defense, and approval of the institutional review board. Doctoral students in psychology gain many transferable skills and general competencies. The list below features six skills that doctoral students acquire throughout their program. Analytical skills in psychology include critical thinking, logical reasoning, detecting patterns, conducting literature reviews, synthesizing information, and developing supporting arguments. Psychologists use interpersonal skills in social interaction, relying on tools like attentive listening, effective speaking, patience, and conveying respect. Psychologists examine different behaviors, such as body language, facial expressions, and group dynamics. These professionals rely on the ability to describe their observations in great detail. Psychologists identify problems, apply critical thinking skills like inference and evaluation of relevant information, and formulate potential solutions. Counselors apply psychotherapeutic theories and practices to facilitate interpersonal functioning, improve well-being, and promote behavioral health throughout a person’s life. Research skills in psychology include research study design, selecting appropriate research methods, formulating research questions, data collection, and data analysis. To practice professional psychology in the U.S., graduates of doctoral programs must obtain a state license. Some states grant exemptions from licensure requirements for certain areas of practice, like industrial-organizational psychology, and a few states require a separate state-specific credential for psychologists in healthcare practice, including mental healthcare. Licensure requirements vary by state and practice specialty. To help candidates keep up to date with requirements, the Association of State and Provincial Psychology Boards maintains PsyBook, a reference database featuring searchable basic licensure information for all U.S. states. Make sure to contact state licensing boards directly to obtain official updated information. After completing a doctoral degree, candidates for licensing must complete 1,500-6,000 supervised clinical work hours, which usually takes one to two years. Next, candidates must achieve a passing score on the examination for professional practice in psychology and a jurisprudence exam, if applicable. Many states require that all applicants earn a doctoral degree from an APA-accredited institution. APA accreditation applies to doctoral programs in counseling, clinical, and school psychology; internships; and postdoctoral residencies. Applicants who did not attend APA-accredited doctoral programs, internships, and/or residencies may encounter difficulties, including additional scrutiny in the licensing process. To maximize your opportunities for optimal licensure, employment, and career advancement, verify your school’s regional or national accreditation and ensure programs and internships meet all APA standards. Active involvement in professional organizations in psychology offers many benefits, including opportunities to collaborate with peers, learn from experts, and expand research possibilities. Conferences, webinars, and discussion forums provide regular updates on emerging areas of professional practice, and offer ongoing networking opportunities. Many organizations offer job boards, internship or practicum placement assistance, and scholarship funding exclusively for members. Other members-only benefits include discounts on journal subscriptions, insurance, and conference registration fee discounts. Consult with department faculty to get help selecting appropriate organizations to facilitate your professional development. To make the most of your membership, you can volunteer to become a mentor, serve on a task force, or get involved in advocacy efforts through service on legislative and ethics committees. Professional organizations provide ongoing opportunities to build collegial relationships, support scholarly inquiry, further your career, and enhance your professional identity as a psychologist. As a nonprofit educational and professional development organization, the ACA represents professional counselors in practice, ensures culturally sensitive and ethical practices, and promotes enhancement and growth of the counseling profession. The APA serves as the most authoritative and respected organization in psychology, establishing scientific standards for professional psychologists in the country. The APA disseminates psychological research, promotes high ethical standards, and encourages field development. Operating a national match program for the placement of doctoral students into internships, the APPIC represents training directors for doctoral and postdoctoral programs. The APPIC also offers service to all members interested in internships. As an organization of board certified clinical psychologists, the AACP encourages ethical practice and high standards of competence. The AACP prepares candidates for board certification. As an international organization dedicated to advancing the science of psychology, the APS supports psychological scientists through sharing cutting-edge research, fostering member connections globally, and working with public policymakers to secure increased support.